Take a day to remember Selena, the Queen of Tejano music, who rocked the world with her chart-topping tunes and her contagious spirit. 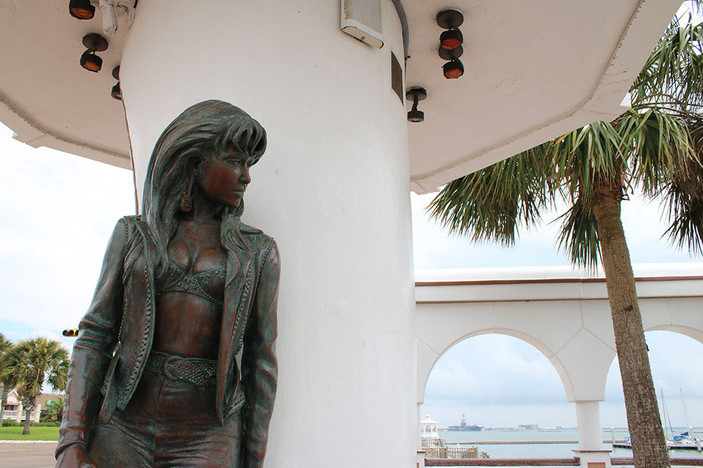 From a downtown statue to the gravesite to a memorial museum, her hometown of Corpus Christi pays tribute to the late singing sensation. Selena was only 23 when she was murdered in 1995, just as her fame was taking off. Sculptor H.W. “Buddy” Tatum’s life-sized bronze statue honors young Selena with a monument against the beautiful backdrop of the seawall on Shoreline Drive. Called “Mirador de la Flor” (View of the Flower), the Selena statue is one of the city’s most popular attractions. The Selena gravesite at Seaside Memorial Park also is a must-see. As you drive into the cemetery at 4357 Ocean Drive, turn left at the first road and follow it almost to the end. The grave is located on the right-hand side. You can usually tell it by the flowers left year-round by her fans. The untimely death of the "Mexican Madonna" prompted her adoring fans to also request a memorial museum in her honor. In response, Selena Quintanilla’s family transformed their recording studio into a memorial that honors her life and accomplishments.